Images taken by witnesses in Syria and Iraq have found that the US-led coalition which is currently fighting Daesh may have used the dangerous and life-threatening white phosphorus chemical munitions, prohibited under international law, in densely populated areas. Photographs and video clips posted online on June 8 show blinding spots of light over the northern Syrian city of Raqqa. The pictures, distributed by the Amaq News Agency, which is linked to Daesh, and activist group Raqqa is Being Slaughtered Silently, show puffs of white light and smoke, which are signs of white phosphorous. ​White phosphorus is a weapon intended to provide a smokescreen for troop movements on the battlefield. It is highly flammable and its spread effect is such that it should never be used in civilian areas. 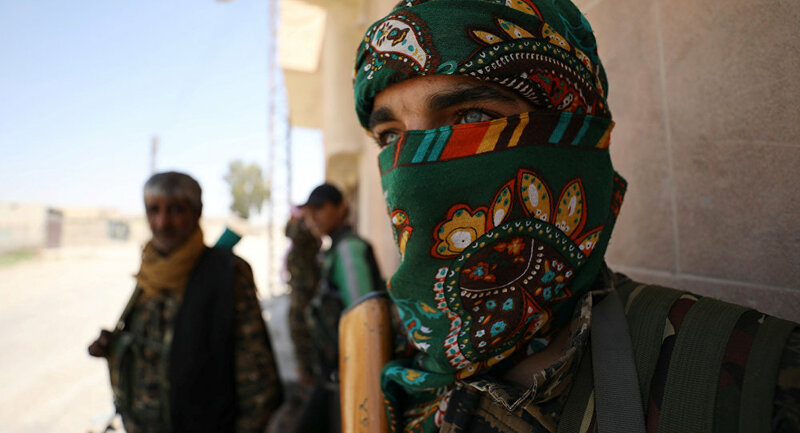 Raqqa is currently under Daesh rule and Operation Euphurates Wrath, which is being led by US-backed Kurdish Syrian Democratic Forces (SDF), has begun to try and remove the terror group, however the consequences of this onslaught on civilians has been huge. 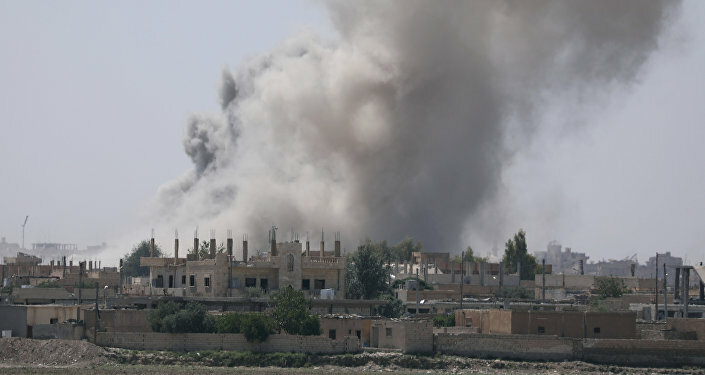 ​Due to the intense ongoing battle in Raqqa, where the US have led coalition army operations, the Syrian people continue to suffer continuous bombardment. The impact of white phosphorus on the human body is catastrophic, medical experts have said that the chemical causes skin to melt away from the bone and can actually break down a victim's jawbone. According to sources, a man named Abdullah, who previously lived in Raqqa, but is now residing in Beirut, said his relatives saw what they believed to be white phosphorus being used in Raqqa. Abdullah also said that an internet cafe had recently been hit by missiles, killing around 20 people. Andrew Feinstein, writer, campaigner and former South African politician, told Sputnik that munitions like white phosphorus have devastating consequences. The fact they are being used in Syria and Iraq is not a new phenomenon however. The US used them for many years — since 1916, as well as during the Vietnam War. "Unfortunately the nature of the world order is such that certain powers can get away with what they want. The obvious thing to say is that this has to stop, the impact of white prosperous on civilians is that it effectively scorches people and in a densely populated area, this form of suffering goes on and on," Mr. Feinstein told Sputnik. "The issue that you have is Western countries won't stop using it immediately. "The world needs to revisit its attitude to the use of munitions generally. We can't talk meaningfully about weapons of mass destruction as whoever is talking about them and telling people to get rid of them is likely to be using it themselves," Mr. Feinstein added. Experts have claimed that the US-led coalition's intelligence should be able to locate where Daesh is and their bombing a civilian area with a dangerous chemical should be avoidable, however according to Andrew Feinstein, the reality may be far more worrying. "The UK and US have advisers who look at areas which should be targeted and they inform the governments. So either these advisers are useless or the leaders of these Western countries are happy to continue selling weapons that actively target civilians," Mr. Feinstein told Sputnik. "Unless the United Nations and Western governments, such as the UK and US, say enough is enough, nothing will change. We need a change of mindset and more transparency when it comes to the arms trade and use of munitions," he said. Andrew Feinstien's comments were echoed by Mary Wareham, advocacy director of the Arms Division for Human Rights Watch (HRW). Mary leads HRW's advocacy against problematic weapons that pose a significant threat to civilians. "The US coalition have admitted to using white phosphorus in certain areas in Raqqa, however they are unwilling to comment on the specific incidents. We know that in both Mosul, Iraq and Raqqa, Syria there is video evidence and we have seen pictures of it being used," Ms. Wareham told Sputnik. Ms. Wareham expressed concern at the use of white phosphorous in Syria and Iraq, mainly due to the fact it had previously been used in Fallujah, Iraq in 2004, with devastating consequences. "At HRW we are trying to talk to people on the ground where white phosphorus is being used, but it is difficult to reach people and we have seen comments from the Iraq saying that it has been used as a smoke screen to try and free civilians, however we have not been able to verify this independently," Ms. Wareham added.